At Jack London Square's The Forge, the pizza is Neapolitan-ish, but the chicken wings and fried cheese are as American as the country fair. The mozzarella curds on the Margherita pie were milky-sweet. Hours: Sun.-Thu. 11 a.m.-10 p.m., Fri.-Sat. 11 a.m.-10:30 p.m.
Maybe I ate at too many terrible chain restaurants growing up, but whenever I hear "American pizza," my mind reflexively goes to Domino's or Pizza Hut. I associate "real" Italian pizza with highbrow pizzerias that have words like antipasti and secondi sprinkled on their menus like shavings of well-aged Parmigiano. It's refreshing, then, to see The Forge, a new pizza restaurant on the Jack London Square waterfront, turn that paradigm on its head — to zig where nearly everyone else has zagged. While the pizzas adhere closely enough to the traditional Neapolitan style to please the purist, the rest of the menu is unapologetically American. We're talking fried-cheese-at-the-county-fair American, as opposed to the kind of Cal-Italian hybridized American that reigns supreme in the Bay Area. There are no pasta dishes, no salumi samplers, no plates of marinated olives. Instead: classed-up riffs on things like mozzarella sticks and buffalo wings. With that simple concept — a strictly American pizza restaurant — the proprietors of The Forge have hit upon a formula that should appeal to a wide swath of diners: from pub-crawlers to hard-core pizza geeks, from foodies to picky pre-teens. The foundation is still a rock-solid pizza pedigree. 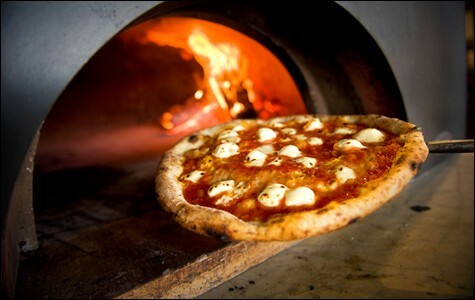 The literal heart of the place is a massive Italian wood-fired oven that can reach temperatures upwards of 800 degrees. More important, though, are the folks manning the oven, who include chef Jeffrey Amber (formerly of Chow and XYZ) and sous chef Jeff Hayden (Dopo and Boot and Shoe Service); both have slung a wood-fired pizza or two in their day. 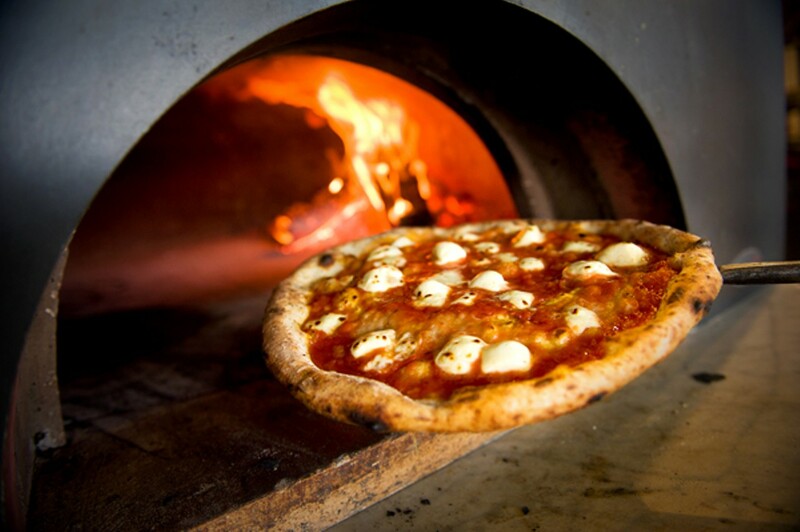 And serving as an ongoing pizza "R&D" consultant is Jeff Krupman, better known as the Pizza Hacker, whose exploits include fashioning a pizza oven out of a portable Weber grill — and MacGyvering out of that what many connoisseurs consider to be one of the best Neapolitan-style pizzas on the West Coast. On a good day, the collaboration between these three yielded as perfect a Margherita pie as I've had in recent memory, even if (or perhaps because) it had little dashes of California that kept it from being strictly traditional: Instead of basil (which wasn't in season), there was a sprinkling of chopped marjoram and parsley. Instead of mozzarella di bufala Campana, there were mozzarella curds from Fairfield — not as wet a cheese, with a wonderful milky sweetness. The sauce, made from California-grown San Marzano-style tomatoes, was savory and well balanced. But mainly it was the crust that stood out. Krupman based the dough on a Tartine Bakery bread recipe, and it was stellar — just chewy enough and full-flavored, with a delicious hit of salt (alderwood smoked salt, no less) on the finish. The crust wasn't especially crisp (it's more of a "knife-and-fork pizza," Amber explained), but the flavors were so good it didn't matter. There are eight specialty pizzas on the menu, and during a subsequent visit we tried the lemony, arugula-topped Three Cheese pie (a good light option) and the Pepperoni. The latter was topped with chunks of house-made pepperoni (more like Mexican chorizo than traditional sliced pepperoni) and tomato sauce spiked with spicy Calabrian chili peppers — tasty enough, though the servers should give fair warning to diners expecting straightforward pepperoni. These pizzas had crispier crusts, but the tradeoff wasn't worth it: The undersides had big burnt patches whose bitterness took away from the dough's great flavor. But with a little more consistency, there's no question The Forge's pies could be some of the very best in the East Bay. Although pizza forms the backbone of the menu, the real fun lies in the starters — the tongue-in-cheek twists on appetizers I associate with chain restaurants. So instead of mozzarella sticks, there were fried cheese curds (that Midwestern staple) served with a long-simmered marinara sauce. These avoided the stringy, congealed texture of your typical mozzarella stick, and their batter was airy and light. Instead of buffalo wings, there were sauce-less smoked chicken wings — meaty, three-bone specimens served with thinly sliced celery and a buttermilk blue cheese dip. The "potato skins," meanwhile, were really small twice-baked potatoes — their flesh mashed after the first baking, making them an excellent vehicle for a pool of potent Taleggio cheese "whiz." The only disappointment was the portion size: Surely when you order potato skins, you expect a generous pile of crunchy goodness — not five tiny half-potatoes. A couple extra spuds would make the plate feel more generous and, I presume, wouldn't break the restaurant's produce budget. There were only a couple of clunkers. A baby romaine salad with deviled eggs and crispy crouton-like breadcrumbs sounded great, but the salad we were served had way too many bitter lettuce leaves and too few of the croutons and the (rather under-seasoned) eggs. And both of the desserts we tried — a bland banana-and-butterscotch pudding and a ho-hum chocolate cheesecake — were pretty uninspired. Still, at its core The Forge is a crowd-pleasing restaurant — a place I wouldn't hesitate to bring even the most conservative chain restaurant partisan. That's not a knock: If I'm going eat mozzarella sticks and potato skins for dinner, these are the ones I want to eat. The setting doesn't hurt either. The outdoor patio area, tricked out with blazing fire pits and Adirondack chairs, is the closest thing to sitting 'round a campfire you'll ever experience in Jack London Square. And the restaurant itself is lovely and expansive, with big picture windows facing out toward the square in every direction. All told, there are eleven beers on tap (almost all from Bay Area breweries) and several flat-screen TVs that are always tuned in to sports. Pizza, beer, and a ballgame — what could be more American?